Stating that preservation of heritage can only be fulfilled when historical, artistic, sociological and economic aspects are considered, the Ambassador of the European Union Tung-Lai Margue made the opening remarks at the 2019 edition of ‘Living Heritage’ conference. 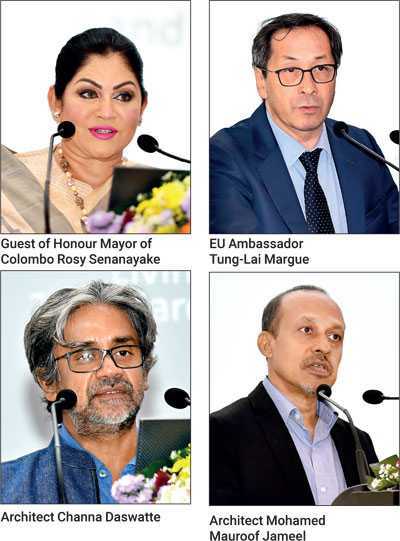 Bringing together speakers offering valuable perspectives on preserving and valuing cultural living heritage from around the world, the 2019 edition of ‘Living Heritage’ was held in Colombo, on 24 and 25 March in Colombo. A full-day conference on ‘Valuing Cultural Heritage: A Cross-Cultural Perspective’ offering perspectives from Europe and South Asia was held on 25 March, after a full-day of guided site visits on 24 March. The conference voiced the challenges faced by cities around the world on balancing urban development against cultural heritage conservation. The Ambassador of European Union Tung-Lai Margue expressed how heritage should be placed high on the EU’s agenda and further explained the importance of developing pragmatic, sustainable and integrative solutions to the challenges faced in preserving cultural heritage, and said education is key in spreading awareness. “Schools and universities have a key role to play in sensitising the value of cultural heritage that is tangible and intangible,” he said. The Ambassador also said there’s an important connection between heritage and identity in the context of globalisation and rapid economic growth, and that lack of thoughtfulness and inclusiveness in urban development can create worse issues than the challenge of heritage preservation. Speakers from Europe and South Asia, including art historians, architects, and urbanists addressed a number of key issues, such as how to regenerate cities through cultural heritage, how to promote smart restoration and adaptive reuse of heritage buildings, as well as how to make cultural tourism sustainable and compatible with natural heritage. The initiative, the third in a series launched in 2016, attracted a very diverse audience including architects, designers, historians, art historians, students and teachers among others. The diversity in the room reflected in itself the importance of a multi-disciplinary approach when looking at cultural heritage. This conversation will continue and further build bridges between Sri Lanka and Europe in an exchange of best practices.